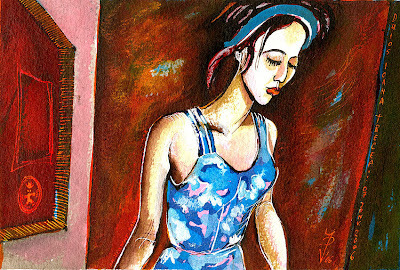 This is a 2006 somewhat more personal watercolor. It represents my daughter, Ioana, a young lady now, always in a hurry and with very little (or none!) time to pose for her father, the artist... I have to take spy pictures of her - decent ones, of course! - and to paint her after those fugitive, in movement photos... Neither her, nor my other two children, give much attention or thought to my paintings... Nobody's a prophet in his/her family, eh?.. Posted by Ion Vincent Danu at 12:06 p.m.
A very specific style, here, identificable. Captures deeply what you write: Ioana has no time to pose for her father! Yes, family is something strange. My family didn´t take my art seriously )I am "normally" a mathematician and worked as such) until I started selling many paintings. Now that ì´m "famous", they all want a painting from me... too late perhaps? October 18, 2007 at 6:23 a.m.
October 18, 2007 at 5:58 p.m. I predict: your daughter won't stay indifferent to this painting forever. October 19, 2007 at 9:27 a.m.
October 19, 2007 at 10:44 a.m.
Ce faptura gingasa ! e cumva Ioana? October 23, 2007 at 8:05 a.m.
October 23, 2007 at 8:19 a.m.
tare scumpa s-a facut Ioana ! October 25, 2007 at 3:54 a.m.
October 25, 2007 at 10:03 a.m.